Located about 30 miles (50 kilometers) north of Krabi, Ao Luk provides visitors a playground of outdoor adventures. While Krabi might bring to mind images of idyllic beaches, Ao Luk is more about the jungle, especially within Than Bok Khorani National Park. Here, eco-tourists find abundant treks, waterfalls, caves, mangrove forests and the stunning (and swimmable) Bok Khorani pond. The park also contains a series of small islands popular for canoeing, snorkeling and diving. An alternate way to explore the Ao Luk district is in the tree tops themselves. 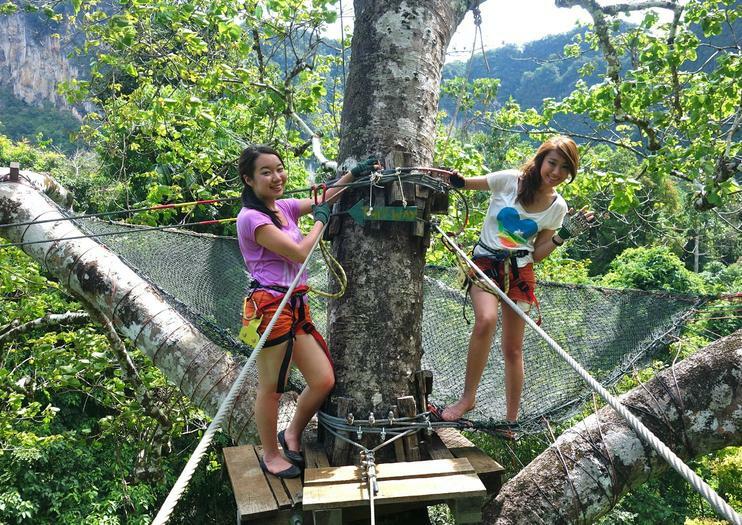 Tree Top Adventure Park, one of the area’s most popular attractions, takes visitors through the canopy from platform to platform by way of rope walks, zip lines, Tarzan swings, rope bridges and flying skateboards. Buses traveling between Krabi and Phuket stop in Ao Luek. Kayak the waters of Ao Luk on this day-long Krabi excursion. With an expert guide leading the way, you’ll explore the area’s sea caves, including Tham Phee Hua Toh, known for its prehistoric wall paintings. Glide among mangrove forest, take a dip in Tha Pom’s clear waters and savor a Thai lunch in a traditional fishing village. Your tour includes transport to and from Krabi. Paddle through caves, lagoons, and rock tunnels on a 5-hour sea kayaking tour from Krabi. Skip the cost of taxis and relax in complimentary hotel pickup and drop-off. Once inside your kayak, follow your guide past local local fishermen, into the stalactite cave of Pee Hua Toh, and beyond. After free time to explore the island on dry land, round out your adventure with a seafood lunch in Tham Khao Wong.